So the big hockey game starts in just 5 days! Eeek!!! In celebration of this, there was a kickoff party last night at the Electric Owl on Main Street. It was a chance for the players, supporters and friends to come out and celebrate this incredible journey we are about to embark on and it was a great time! I’d never been to (or even heard of) the Electric Owl before, but it rocks! Totally cool space, and fun Japanese-ish food. I say “-ish” because I’m pretty sure that poutine is not a traditional Japanese food, but poutine garnished with nori and eaten with chopsticks feels Japanese. Have you ever eaten poutine with chopsticks? Neither had I… until last night! Basically, all the food was awesome, the staff was awesome and champagne, which was provided by Neck of the Woods Winery, was, in fact, awesome. The MC for the night pointed out something that I hadn’t really thought of – with this event, we are making ourselves a part of Canadian history. Not that many people get to do something this epic and when he said that, it really hit me. Holy crap, we are doing something huge here! For dinner, I sat with fellow player and (technically) co-worker, Julie Makranyi. I say “technically” because we work for an organization with more than 26,000 employees, so we don’t actually work directly together. It was awesome getting to know Julie better – even if she is on the opposing team! lol! 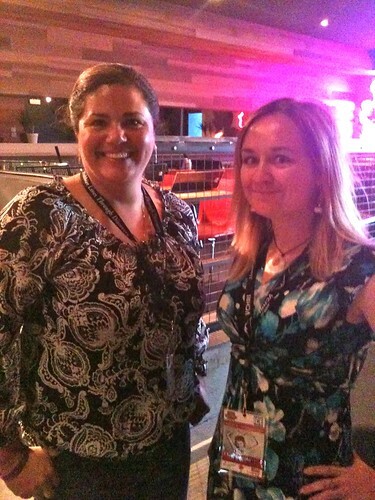 Julie Makranyi and I at the Kickoff Party! Julie started a blog about being part of the game, so you should totally check out her blog. You can also follow her on Twitter. We also sat with a lovely couple, Michelle & David Paul, that we met when Michelle introduced herself, saying that she’d seen my blog on the LG4CF page. They are friends of some of the players and were super fun! And when I checked my donation page this morning, I saw that Michelle had donated to my fundraising! Thanks, Michelle! 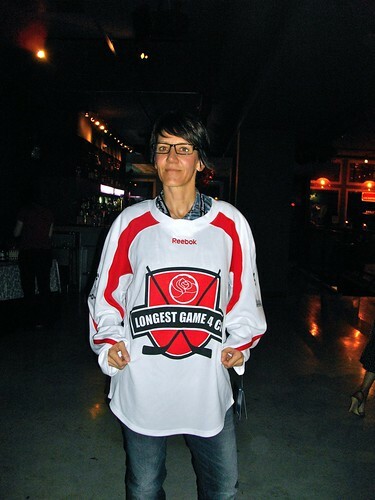 Our fearless leader, Val Skelly, rocking the white team jersey! So five days, people! Five days to get myself ready for the craziest and most awesome thing I’ve ever done. I’ve picked up a spare pair of skates at Sport Junkies, I’ve started a pile of things in my living that I’m going to need to bring, and I’m heading over to Kim’s place this afternoon to pick up some of her hockey gear as back ups. Other than preparing for the game specifically, I have only three work days and one minor detail to take care of and then it’s on! Oh yeah – and don’t forget to donate! Hey Beth, great to have shared a table with you for dinner! I donated to both you and Julie this morning since you’re doing such a fantastic thing. One small correction, my husband’s name is Paul.We’ll see you at 8 rinks and enjoy the 4 hours of 1980s metal music that I requested be played over the loudspeakers as part of my sponsorship! Oops, thanks for the correction! David is Julie’s husband’s name! D’oh! And thanks so much for the generous donation – I really do appreciate it! It was great to have dinner with you yesterday and I’ll be sure to enjoy the 80s metal you requested! I hope you’ll get a chance to come out and watch some of the game!